Wil and the crew of the Ghost saved a bunch of star systems from war and helped keep them from joining the Galactic Commonwealth against their will, so now what? Not fame and fortune, that’s for sure! Thanks to an intergalactic crime boss and all around horrible being, there’s a price on their heads, so Wil and crew take jobs as privateers. Boring, but the pay is good, so there’s that. All good things come to an end though, and soon enough the team is dodging bounty hunters and mechanical monsters from a sushi nightmare, all because they answered a call from an old friend. 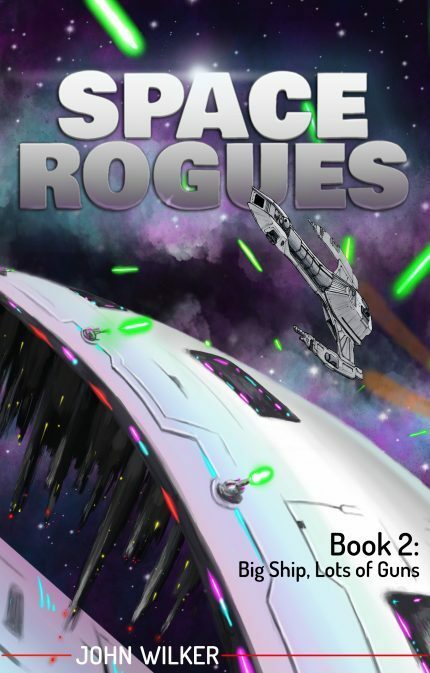 The adventures continue in book two, and there are tons of laughs, a few tears (of sadness and joy) and the first ever Taco Tuesday in space! Space Tacos? Can Wil and the crew save the day one more time?